Background: Pneumocystis jirovecii colonization in patients is associated with a low organism burden, which supports the need to use highly sensitive molecular techniques, such as nested-PCR to determine the presence of the organism. However, few studies have considered the effect of nucleic acid extraction methods on the detection of P. jirovecii. Here, we evaluate how pre-treatment affects microbial detection. Methods: Lung tissue samples from fifteen autopsied infants were processed using two different DNA extraction protocols: 1) the QIAamp DNA Mini kit (Qiagen) (method A) and the QIAamp DNA Mini kit (Qiagen) with additional steps including a pre-treatment, bead-beating and phenol-chloroform steps (method B). Detection of P. jirovecii was performed using the conventional nested-PCR in lung tissue samples. In addition, we estimated the bacterial, fungal and human DNA using qPCR method. Results: Higher DNA yields was obtained with DNA extraction method B compared to method A. P. jirovecii was detected in 10 out of 15 lung tissue samples for both methods at the first or second round of PCR. However, P. jirovecii was detected in 9 out of 10 at the first round with the DNA extraction method B, rather than those processed with DNA extraction method A that were detected in 5 out of 10. Moreover, the faint PCR band intensity observed in 2 out of 6 samples processed with DNA extraction method A was increased with method B. We also observed that DNA extraction method B increased significantly the bacterial and fungal DNA, but not the human DNA, compared to method A. Conclusions: Our findings show that the additional steps (i.e. pre-treatment, bead-beating and Phenol: Chloroform: Isoamyl alcohol steps) supplemented to the QIAamp DNA Mini kit (Qiagen) improves the detection of P. jirovecii in lung tissue samples. Pneumocystis colonization in asymptomatic subjects is an area of increasing clinical and research interest and may be important in the development of Pneumocystis jirovecii pneumonia (PcP), as well as other lung diseases such as chronic obstructive pulmonary diseases . In effect, the colonization of Pneumocystis seems to be highly prevalent among the general population, at least in some studies , and particularly in children, who appear to have a higher prevalence of colonization than adults . However, Pneumocystis colonization is associated with a low organism burden when compared to patients with PCP and a low burden makes the detection by the immunofluorescence staining method used in diagnosis more difficult. In that case, Pneumocystis colonization is generally performed using techniques based on DNA amplification (PCR). Particularly, the nested-PCR allowed for the detection of minute burdens of Pneumocystis organisms in immunocompetent host that is undetected by techniques used for the diagnosis of Pneumocystis pneumonia (PcP) . Although the use of nested polymerase chain reaction (PCR) by employing two rounds of PCR is known to increase the detection of low concentrate target, if the levels of Pneumocystis in colonized subjects reach the detection limit, it will inadvertently decrease the sensitivity of Pneumocystis detection and most likely will underestimate the prevalence of colonized individuals. In addition, it is known that the PCR capacity to detect microorganisms depends on the purity of the template . While the majority of papers attempted to optimize the detection of P. jirovecii by improving PCR method, few have considered the nucleic acid extraction methods [5,6,7,8]. This is of particular concern since fungal organisms possess rigid cell walls resisting to chemical lysis techniques that are commonly used. Generally, protocols used to extract fungal DNA incorporate a mechanical lysis step such as glass-bead-beating or phenol step to increase the recovery of DNA. In this study, we compare the effect of two DNA extraction methods on the detection of P. jirovecii using the conventional nested-PCR in lung tissue samples, as well as on the level and the purification of extracted DNA. Autopsied lung tissues from infants (under one-year-old) diagnosed as sudden, unexpected death in the community in Chile were used in this study. Autopsy diagnosis was established on the basis of clinical history, results of post-mortem laboratory tests, and gross findings. The right upper lobes were kept frozen at -80°C for DNA extraction. We selected fifteen autopsied infants for which 10 had been identified as colonized and five not colonized for Pneumocystis in a preceding study . Infants were categorized as Pneumocystis positive when the P. jirovecii DNA specific 267 bp band was obtained by nested-PCR  in 1 or more analyzed lobes, and as Pneumocystis negative if no P. jirovecii DNA was documented in 3 lobes. Pneumocystis-negative lobes were analyzed twice, starting from the tissue. In this work, we evaluated two different DNA extraction protocols. Total DNA was extracted from 0.4 g of infant lung tissues using 1) the QIAamp DNA Mini kit (Qiagen) previously used to detect Pneumocystis in lung tissue samples (method A), and 2) the QIAamp DNA Mini kit (Qiagen) with additional steps including a pre-treatment, bead-beating and phenol-chloroform steps (method B). All manipulations were made inside a biosafety cabinet using new sterile equipment. For method A, small lung tissue pieces were homogenized in 200-μL of PBS using the Ultra Turrax® homogenizer(Biospec Products Inc.) and DNA was extracted and purified using the QIAamp DNA Mini kit (Qiagen), according to the manufacturer’s procedure. For method B, a pre-treatment steps were applied previously, consisting to homogenize small pieces of lung tissue by magnetic stirrer agitation in 20 mL of sterile PBS (pH 7.2) in ice pack–covered screw-capped flasks for 30 min. The homogenate was filtered using sterile gauze and centrifuged at 4°C for 10 min (2,900 x g). From the pellet reconstituted in 200 µL of sterile PBS (pH 7.2), total DNA was extracted using the QIAamp DNA Mini kit (Qiagen) supplemented with a phenol-chloroform and bead-beating steps. Briefly, lung tissue was disrupted with ATL buffer containing proteinase K and incubated at 56°C for 60 min and then lysed by adding 200-μL AL lysis buffer and incubating at 70°C for 10 min. Then, we added sterilized zirconia/silica (0.1 mm and 0.5 mm diameter) beads mix and a volume of Phenol: Chloroform: Isoamyl alcohol (25: 24: 1) in the tubes that were homogenized using a Mini-Beadbeater-8 at two cycles of 500 oscillations/min of 3 min each. Next, the tubes were centrifuged at 4°C for 10 min (20,000 x g) and the aqueous solution was transferred into a new 2-mL tube that was used for the washing and purification of the DNA as described in the QIAamp DNA Mini kit (Qiagen). For both DNA extraction methods, the DNA was eluted with 100-μL of buffer supplied with the kit. DNA concentrations were measured using the Qubit double-stranded DNA (dsDNA) BR assay kit on a Qubit 4.0 fluorometer (Invitrogen, Carlsbad, CA). As DNA extracts can contain proteins and other organic molecules that are known to affect downstream procedures such as DNA amplifications in PCR, we determined the DNA purity by measuring the ratios of absorbance at 260/280 and 280/230 using a NanoDrop 1000 spectrophotometer (Thermo Scientific, Pittsburgh, PA, USA). Pneumocystis DNA was identified using a nested-PCR procedure as described previously . Briefly the first round of PCR was performed using the oligonucleotide primers pAZ102-E and pAZ102-H, which amplified a portion of the mitochondrial large subunit (mt LSU) of the rRNA gene of Pneumocystis sp. and the second round of PCR using pAZ102-X and pAZ102-Y primers, which are internal to the first set of primers and specific for P. jirovecii . To control contamination, water was used as template at the first round PCR, which was used de novo as template for the second round PCR (negative controls). DNA amplification was performed twice for each sample. The PCR product was analyzed by electrophoresis in a 2% agarose gel and was visualized with GelRed®. DNA extraction samples were adjusted to 10 ng/µL using the Qubit 4 Fluorometer (Invitrogen) and then, bacterial, fungal and human DNA were estimated using qPCR methods and specific primers. Each sample was analyzed in duplicate in two independent real-time PCR assays in order to identify potential differences between replicates. qPCRs were performed in a LightCycler® 480 System (Roche Molecular Diagnostics) using 10 µL of a reaction mix that contained 5 µL of LightCycler® Fast Start DNA MASTER PLUS SYBR Green I (Roche), 2.4 µl of DNase-free water, 0.3 µM of each primer and 2 µL of extracted DNA (10 ng/µL). We used the following primers: the forward 515F 5’-GTGCCAGCMGCCGCGGTAA-3’ and reverse 5’-CTTGTGCGGKCCCCCGYCAATTC-3’ to amplify the V4 hyper variable region of the 16S rRNA gene of Bacteria ; the forward 5'-TTAGCATGGAATAATRRAATAGGA-3’ and reverse 5'-TCTGGACCTGGTGAGTTTCC-3’ to amplify the V4 (partial) and V5 variable regions of the 18S rDNA of fungi ; and the forward 5’-TTGTTACAGGAAGTCCCTTGCC-3’ and the reverse 5’-ATGCTATCACCTCCCCTGTGTG-3’ to amplify the human β-actin. Cycling conditions included incubation at 95°C for 10 min, and 40 cycles of 95°C for 10 s, 58°C (16S rRNA), 57°C (18S rDNA) or 59°C (β-actin), for 10 s and 72°C for 15 s. DNA amplification products were confirmed by melting curve analysis using the LightCycler® software, and by electrophoretic separation in a 2% agarose gel staining with GelRed®. Extracted microbial DNA performed with the two DNA extraction methods was estimated using the threshold cycle (Ct) values obtained for each sample. GraphPad Prism software version 7 (GraphPad Inc. San Diego, CA) was used for calculation of statistical data such as the mean and median, standard deviation (SD), and the interquartile range (IQRs) for the DNA concentration, A260/A280 and A260/A230 ratios, or Ct values. 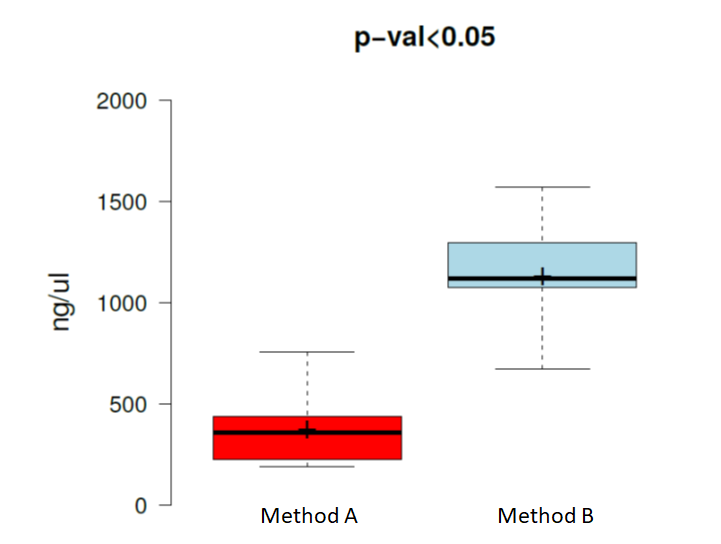 Box plots were created using the free statistical package R 3.1.0 . Statistical comparisons between the two extraction methods were made using paired t-tests. All comparisons were two-tailed, and the confidence level was set at 95%. Concentrations and quality of extracted DNA recovered with the two DNA extraction methods from 15 lung tissue samples are presented in Table 1. We found that DNA extraction method influenced yield and purity of the extracted DNA. As shown in Table 1, DNA extraction method B, including bead-beating, Phenol-Chloroform isoamyl alcohol steps, produced higher DNA yields than DNA extraction method A (only QIAamp DNA Mini kit (Qiagen) 1,122.0 ng/µL (IQR 1078.4 ng/µL to 1295.8 ng/µL) vs 360.5 ng/µL IQR (IQR 226.9 ng/µL to 437.9 ng/µL, P < 0,001) (Figure 1). However, we obtained more than 10 ng μL−1 for both DNA extraction methods, indicating that further PCR amplification was possible. The quality of the extracted DNA was evaluated using the A260/A280 and A260/A230 ratios for both DNA extraction methods (Table 1). The A260/A280 ratio was statistically different between both DNA extraction methods. Method B gave an A260/A280 ratio higher and closer to 1.8 than method A (1.70 ±0.06 vs 1.11 ±0.17, p = 0.0000). Similarly, we found a higher A260/A230 ratio and closer to 1.8 for method B compared to method A (1.93 ± 0.13 vs 0.89 ±0.27, p = 0.0000). Figure 1 Box plots generated showing the concentration of DNA obtained for each extraction method for 15 lung tissue samples. Boxes are delimited by the first and third quartiles, the upper and lower whiskers extent follow Spear definition; the median (solid horizontal line) and mean (cross) are displayed. Table 1 Concentration and quality ratios of the extracted DNA recovered with the two DNA extraction methods (A and B) from 15 lung tissue samples. To assess whether the extraction methods improve the detection of P. jirovecii, lung tissue samples processed with both DNA extraction methods were subjected to the nested-PCR that is the method reference for the detection of P. jirovecii [10,11]. P. jirovecii is detected in 10 out of 15 lung tissue samples (lung positive tissue samples), independently of the DNA extraction method. Negative controls performed at the first and second round of the nested-PCR did not show amplification. For lung tissue samples processed with the DNA extraction method A, 6out of 10 lung positive tissue samples were detected at the first round and 10 out of 10 at the second round of PCR. However, when using the DNA extraction method B we detected P. jirovecii at the first round of PCR in 9 out of 10 lung positive tissue samples and 10 out of 10 at the second round of PCR. In addition, the agarose gel of PCR products performed at the first and second round of the nested-PCR revealed that the PCR signal was increased at the first round of nested-PCR for 5 out of 10 lung positive tissue samples processed with DNA extraction method B (Figure 2). Figure 2 Nested-PCR amplification of P. jirovecii in 5 lung samples using two different extraction methods (see text). First round (A and B) and second round (C and D). Lanes LD: Molecular weight Ladder; lanes 1, 4, 7, 10, 13, 17, 20, 23, 26 and 29: negative controls; lanes 2, 5, 8, 11, 14, 18, 21, 24, 27 and 30: undiluted samples; lanes 3, 6, 9, 12, 15, 19, 22, 25, 28 and 31: diluted samples and lanes 16 and 32: positive controls. We evaluated whether DNA extraction methods affect the bacterial, fungal and human DNA loads in our samples. As the Ct value is proportional to the log of the initial amount of target DNA copies, we amplified the DNA loads 16S rRNA (bacteria), 18S rRNA (fungal) and β-actin (human) in our samples. Then we compared the Ct values obtained for lung tissue samples processed with DNA extraction method A and B (Table 2) (Figure 3). DNA extraction samples were adjusted to 10 ng/µL using the Qubit 4 Fluorometer (Invitrogen) to compare between the methods. For specific bacterial qPCR assays (Figure 3A), the Ct values were significantly lower for lung tissue samples processed with DNA extraction method B compared to those processed with DNA extraction method A (23.68 ± 3.91 vs 25.01 ± 3.11 p = 0.0011). For specific fungal qPCR assays (Figure 3B), we observed similar data with significant lower Ct values from lung tissue samples processed with DNA extraction method B compared to method A (37.71 ± 1.19 vs 38.86 ± 1.23, p = 0.0003). However, we did not observe significant difference for the human DNA load by qPCR amplification of β-actin gene in lung tissue samples processed with both DNA extraction methods (Figure 3C). The Ct values were not statistically different between those processed with DNA extraction method A (18.27 ± 0.99) and B (17.99 ± 0.32). Table 2 Average threshold cycle (Ct) and standard deviation (S.D.) obtained from two different assays using two replicates and real-time PCR for 16S rRNA (bacteria), 18S rRNA (fungal) and β-actin (human) genes in 15 lung tissue samples obtained with the two extraction methods (A and B). Figure 3 Box plots displaying the average Ct values obtained by real-time qPCR amplification of the 16S rRNA (A), 18S rRNA (B) and human ß-actin genes (C) for extraction methods A and B from tissue lung samples. In this study, the detection of P. jirovecii was evaluated in lung tissue samples processed with two DNA extraction methods: the QIAamp DNA Mini kit (Qiagen) and another based on the QIAamp DNA Mini kit (Qiagen) with previous additional steps including a pre-treatment, bead-beating and Phenol: Chloroform: Isoamyl alcohol steps. Among 15 lung tissue samples analyzed, 10 samples processed with DNA extraction method A and B were positive for P. jirovecii using the nested PCR techniques. Particularly, our work revealed that the DNA extraction method B improved the detection of P. jirovecii by nested-PCR in lung tissue samples. P. jirovecii was detected in the first PCR round for the majority of lung tissue samples processed with DNA extraction method B (9/10), rather than those processed with DNA extraction method A (6/10). Among these positive samples that were processed with DNA extraction method A and detected in the first PCR round (6/10), 2 out of 6 samples presented a faint PCR band intensity in the agarose gel. Nevertheless, the PCR band intensity of these two samples was enhanced when these samples were processed with DNA extraction method B. Also, 3 samples that were negative with method A were positive with method B. Collectively, these data show that the DNA extraction method B improve the detection of P. jirovecii in lung tissue samples. Our findings show that DNA extraction method B, including the additional steps, gave a better purity compared to method A. Moreover, DNA extraction method B gave 260/280 and 260/230 ratios higher and closer to 1.8, which indicate a good DNA extract without protein contamination as recommended by Samuel and colleagues . This aspect may be attributable to the Phenol: Chloroform: Isoamyl alcohol step added in DNA extraction method B, as phenol is commonly used for removing proteins from a DNA sample. In addition, DNA extraction method B increases significantly the concentration of extracted DNA compared to DNA extraction method A. It is known that mechanical lysis using bead-beating increases the extraction of DNA from fungal organisms, as cell walls of fungi are difficult to extract. Similarly, previous studies have shown that bead-beating steps increased the DNA extraction of Gram-positive bacteria that have a thick and resistant cell wall . In agreement with these results, we showed that bacterial and fungal DNA estimated by qPCR were present in higher concentration in lung tissue samples processed with DNA extraction method B, compared to those processed with DNA extraction method A. The lower Ct of bacterial and fungal qPCR observed in samples processed with DNA extraction method B compared to method A, unlike the similar values obtained for β-actin gene by both methods, suggest that the increased bacterial and fungal DNA amount obtained with DNA extraction method B is not caused by better efficiency of the qPCR but by a better efficiency of this extraction method. Our results suggest that method B not only increases the concentration of total DNA but it also specifically increases the relative amount of microbial DNA compared to the human DNA. In addition to the bead-beating step, the pre-treatment step could also participate in the increase of the bacterial and fungal DNA in samples processed with DNA extraction method B. The pre-treatment step consisted to 1) pick up microorganisms associated with lung tissue samples through magnetic stirrer agitation in sterile PBS; and 2) to filter the homogenate using sterile gauze, followed by a centrifugation in order to concentrate the lung-associated microorganisms. This process leads certainly to concentrate the microbial DNA in our samples, although we cannot demonstrate it. To conclude, the previous additional steps (pre-treatment, bead-beating and Phenol: Chloroform: Isoamyl alcohol) supplemented to the QI Aamp DNA Mini kit (Qiagen) improve the detection of P. jirovecii by increasing the extracted amount and quality of Pneumocystis DNA from lung tissue samples. As genomic approaches can overcome the difficulties of microscopic examination, this improved DNA extraction protocol will facilitate the detection of P. jirovecii in human samples that demand high-quantity DNA input from limited source material. In addition, our findings can be expanded in the future for the use of quantitative PCR, which data can address issues of the correlation between tissue burden and outcome. We would like to thank the Servicio Médico Legal of Chile of Santiago and the FISABIO-Salud Pública for providing us with the facilities and equipment that allowed us to carry out this study. S.L.V. and F.M. planned the study. G.G, V.S.G and M.G. recruited the infants and collected the lung samples. S.R.R, C.P. N.P. and R.B. conducted the experimental work. V.P.B., S.R.R. and F.M. performed the bioinformatic and statistical analyses. S.R.R wrote the first draft of the manuscript. All authors read and approved the manuscript. This project has received funding from ERANet LAC (ELAC2014/HID-0254), from Carlos III Institute of Health (project and AC15/00022), and from The National Fund for Science and Technology (Fondecyt, Chile) Grant number 1140412 (SLV). Sing A, Trebesius K, Roggenkamp A, Rüssmann H, Tybus K, Pfaff F, et al. Evaluation of diagnostic value and epidemiological implications of PCR for Pneumocystis carinii in different immunosuppressed and immunocompetent patient groups. J Clin Microbiol. 2000; 38: 1461-1467. Matos O, Lundgren B, Aguiar P, Costa M, Antunes F. Comparison of four methods for extraction of Pneumocystis carinii DNA from pulmonary specimens and serum. J Eukaryot Microbiol. 1999; 46: 102S-103S. Rodiño JM, Aguilar YA, Rueda ZV, Vélez LA. Usefulness of FTA (R) cards as a Pneumocystis-DNA extraction method in bronchoalveolar lavage samples. Infect Dis. 2016; 48: 1-6. Wakefield AE. DNA sequences identical to Pneumocystis carinii f. sp. carinii and Pneumocystis carinii f. sp. hominis in samples of air spora. J Clin Microbiol. 1996; 34: 1754-1759. R Development Core Team. R: A language and environment for statistical computing. Vienna: R Foundation for Statistical Computing; 2013. Available from: http://www.R-project.org. Fujimoto S, Nakagami Y, Kojima F. Optimal bacterial DNA isolation method using bead-beating technique. Mem Kyushu Univ Dep Health Sci Med Sch. 2004; 3: 33-38.